Summary: Thailand's pristine Ko Phi Phi island attracts tourists from around the world. There, struggling to make ends meet, small-resort owners Lek and Sarai are happy to give an American named Patch room and board in exchange for his help. But when Patch's brother, Ryan, arrives, accompanied by his girlfriend, Brooke, Lek learns that Patch is running from the law, and his presence puts Lek's family at risk. Meanwhile, Brooke begins to doubt her love for Ryan while her feelings for Patch blossom. A few years ago, I reviewed a wonderful book called DRAGON HOUSE by John Shors. When the author recently contacted me to read his latest novel called CROSS CURRENTS, I jumped at the chance. CROSS CURRENTS takes place on Thailand's Ko Phi Phi island in the days leading up to the catastrophic tsunami in late 2004. It tells the story of a struggling Thai family who owns a small resort and the mysterious American Patch who is helping them maintain their property. When Patch's brother Ryan (and his girlfriend Brooke) arrive on the scene to help Patch with some legal troubles, things become very complicated for both families. I found CROSS CURRENTS to be a very good read. Maybe it's because I enjoy books about the complexities of family life, but I thoroughly enjoyed seeing how both sets of family members interacted with their own families other as well as with each other. I thought Mr. Shors did a terrific job of featuring the relationship between Patch and Ryan -- all those confusing feelings of love and jealousy; and I appreciated that their interactions seemed pretty authentic. There was a great deal of tension between both Patch and Ryan from the moment that Ryan arrives on the scene; however, when Patch finds himself falling for Ryan's girlfriend Brooke, their relationship definitely begins to fall apart. While both characters and their actions were far from perfect, I found that I could understand (and even relate a little bit) to each of them. In addition to enjoying the dynamics between Patch and Ryan, I also enjoyed seeing how the Thai family related to each other. Lek and Sarai had a strong marriage based on mutual love and respect despite facing continual poverty and other hardships. I was amazed by the amount of work they did just to feed their family. I also loved the attitudes of their children and Sarai's mother. The entire family was filled with so much inner strength and they were able to find happiness in each other. Their outlook on their lives was truly inspiring to me. Another thing I enjoyed about CROSS CURRENTS is that brought to life Ko Phi Phi Island for me. I loved reading about the beauty and tranquility of the island along with how special its inhabitants were. And that is a huge testament to Mr. Shors. It is apparent that he loves this country and has visited it many times to be able to capture it in such a memorable way. His prose and descriptions were beautiful and I almost felt as if I were visiting this exotic location as I read the novel. Like many of you, I saw so many devastating images of the tsunami and my heart just broke for the people of Thailand. CROSS CURRENTS managed to bring it all back to me. This book's ending is extremely difficult to read, yet it is also uplifting in one of those "individuals can be amazing in times of tragedy" ways. This island was destroyed and there was so much loss, but many people still held onto some semblance of home. There is no doubt that this novel will break your heart and make you appreciate the life you have. CROSS CURRENTS would make a wonderful selection for a book club discussion. There is even a reading guide in the back of the book with fifteen thought-provoking questions. In addition, there is an interesting interview with Mr. Shors where he discusses his inspiration for the novel. Some of the themes you might want to explore at your meeting include your reactions to the Indian Ocean tsunami, the relationships between locals and tourists in Thailand, cultural differences, love, family, obligation, devotion, happiness, tragedy, sacrifice, beginnings, and challenges. There is definitely a great deal to discuss about these very unique characters, and I am sure you will come up with many more topics. I enjoyed CROSS CURRENTS a great deal and I loved that it gave me some things to think about. 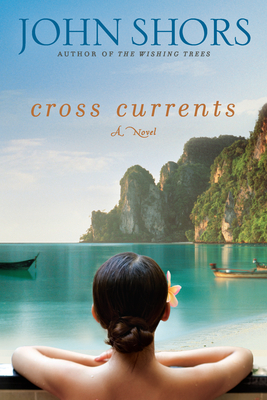 If you are interested in books about exotic locations or ones with complex family dynamics, then I recommend checking out CROSS CURRENTS. Thanks to the author for sending a copy of his novel. I have been meaning to try John Shors books for a long time. I am pretty sure I will like his books a lot! I have this book on my nightstand. Let me know if you think it is a fast read, because I was thinking about reading it for the readathon. I have a twisted obsession with these disasters, and the resiliance of humanity. There haven't been as many books written about the tsunami as 9/11 but they are out there, and it always chills my blood when I relive it. Nice review. I haven't experienced Shors' writing yet, but it does sound like he really brings his settings to life. This book sounds wonderful. Gosh, I knew that's where I knew the author's name from! I couldn't remember until your post! I have a copy of this book and look forward to reading it. Even more after your review. I do remember the images of that awful tragedy. Just terrible. I could not put this one down. It was one of my favorites from Shors! I think my review called this "devastatingly beautiful." I wish I had a book club to discuss this one because it was THAT good. I could discuss it for hours. Mmm this sounds like a great book for heating things up as the weather bets cooler, here! Lovely stuff. Thanks for the review!! I've been reading this, too .. posted a little teaser and thoughts on it today. What a great read - we know the tsunami is coming, which adds to the tension of the financial strain, Patch's mystery, etc. I have this sitting on my tbr stacks. I haven't read any books by this author but have heard many great things about his books. This sounds like a heart wrenching yet heart warming read. I love a good book about family dynamics! The reviews for this are hitting the blogs today and it sounds just great. I'm going to have to go look for this. Very nice review. I have wanted to read John Shors for ages and still haven't found the time!